It’s our hope that charities leverage this guide to educate their organizations and help manage their regulatory risk. 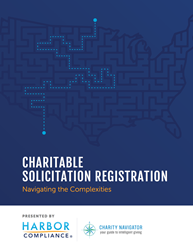 Today Harbor Compliance and Charity Navigator released Charitable Solicitation Registration: Navigating the Complexities, a guide to help nonprofits of all sizes meet state and federal regulations governing fundraising. Are all nonprofits required to register with the state before raising funds, or are there exceptions for small nonprofits? What activities count as fundraising? How do professional fundraisers affect the requirements? What regulations apply to email and online campaigns? What happens if a nonprofit receives donations without being registered? The guide is available online at https://www.harborcompliance.com/landing-pages/charitable-solicitation-registration-navigating-the-complexities. Founded by a team of government licensing specialists and technology trailblazers, Harbor Compliance is a leading provider of compliance solutions for companies of all types and sizes. Since 2012, we have helped more than 10,000 businesses and nonprofit organizations apply for, secure, and maintain licensing across all industries and activities. Our headquarters are located at 48-50 W. Chestnut St. Suite #300, Lancaster, PA.
Charity Navigator is the largest expert charity evaluator in America. The organization helps guide intelligent giving by evaluating the Financial Health, Accountability and Transparency of charities and by providing data about 1.6 million nonprofits. Charity Navigator does not charge the organizations it evaluates, ensuring unbiased evaluations, nor does it charge the public for this trusted data. As a result, Charity Navigator, a 501(c)(3) public charity itself, depends on support from individuals, corporations and foundations that believe it provides a much-needed service to America's charitable givers. Charity Navigator can be reached at (201) 818-1288 or by mail at 139 Harristown Road, Suite 101, Glen Rock, NJ 07452.